For the tutor and educational author, see Jean Baptiste Perrin (fl. 1786). For the Swiss composer, see Jean Perrin (composer). For the IT entrepreneur, see Jean Georges Perrin. 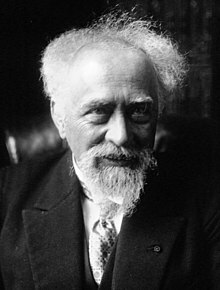 Jean Baptiste Perrin ForMemRS (30 September 1870 – 17 April 1942) was a French physicist who, in his studies of the Brownian motion of minute particles suspended in liquids, verified Albert Einstein’s explanation of this phenomenon and thereby confirmed the atomic nature of matter (sedimentation equilibrium). For this achievement he was honoured with the Nobel Prize for Physics in 1926. Born in Lille, France, Perrin attended the École Normale Supérieure, the elite grande école in Paris. He became an assistant at the school during the period of 1894–97 when he began the study of cathode rays and X-rays. He was awarded the degree of docteur ès sciences (PhD) in 1897. In the same year he was appointed as a lecturer in physical chemistry at the Sorbonne, Paris. He became a professor at the University in 1910, holding this post until the German occupation of France during World War II. In 1895, Perrin showed that cathode rays were of negative electric charge in nature. He determined Avogadro's number (now known as the Avogadro constant) by several methods. He explained solar energy as due to the thermonuclear reactions of hydrogen. After Albert Einstein published (1905) his theoretical explanation of Brownian motion in terms of atoms, Perrin did the experimental work to test and verify Einstein's predictions, thereby settling the century-long dispute about John Dalton's atomic theory. Carl Benedicks argued Perrin should receive the Nobel Prize in Physics; Perrin received the award in 1926 for this and other work on the discontinuous structure of matter, which put a definite end to the long struggle regarding the question of the physical reality of molecules. Perrin was the author of a number of books and dissertations. Most notable of his publications were: "Rayons cathodiques et rayons X" ; "Les Principes"; "Electrisation de contact"; "Réalité moléculaire"; "Matière et Lumière"; "Lumière et Reaction chimique". Perrin was also the recipient of numerous prestigious awards including the Joule Prize of the Royal Society in 1896 and the La Caze Prize of the French Academy of Sciences. He was twice appointed a member of the Solvay Committee at Brussels in 1911 and in 1921. He also held memberships with the Royal Society of London and with the Academies of Sciences of Belgium, Sweden, Turin, Prague, Romania and China. He became a Commander of the Legion of Honour in 1926 and was made Commander of the Order of Léopold (Belgium). In 1919, Perrin proposed that nuclear reactions can provide the source of energy in stars. He realized that the mass of a helium atom is less than that of four atoms of hydrogen, and that the mass-energy equivalence of Einstein implies that the nuclear fusion (4 H → He) could liberate sufficient energy to make stars shine for billions of years. A similar theory was first proposed by American chemist William Draper Harkins in 1915. It remained for Hans Bethe and Carl Friedrich von Weizsäcker to determine the detailed mechanism of stellar nucleosynthesis during the 1930s. In 1927, he founded the Institut de Biologie Physico-Chimique together with chemist André Job and physiologist André Mayer. Funding was provided by Edmond James de Rothschild. In 1937, Perrin established the Palais de la Découverte, a science museum in Paris. Perrin is considered the founding father of the National Centre for Scientific Research (Centre National de la Recherche Scientifique (CNRS)). Following a petition by Perrin signed by over 80 scientists, among them eight Nobel Prize laureates, the French education minister set up the Conseil Supérieur de la Recherche Scientifique (French National Research Council) in April 1933. In 1936, Perrin, now an undersecretary for research, founded the Service Central de la Recherche Scientifique (French Central Agency for Scientific Research). Both institutions were merged under the CNRS umbrella on October 19, 1939. His notable students include Pierre Victor Auger. Jean Perrin was the father of Francis Perrin, also a physicist. Perrin was an atheist and a socialist. He was an officer in the engineer corps during World War I. When the Germans invaded France in 1940, he escaped to the U.S.A., together with his partner Nine Choucroun. He died in New York City. After the War, in 1948, his remains were transported back to France by the cruiser Jeanne d'Arc and buried in the Panthéon. ^ Kyle, R. A. (1979). "Jean Baptiste Perrin". JAMA: the Journal of the American Medical Association. 242 (8): 744. doi:10.1001/jama.242.8.744. ^ Mauro Dardo (2004). Nobel Laureates and Twentieth-Century Physics. Cambridge University Press. pp. 114–116. ISBN 0521540089. Retrieved 13 February 2014. ^ N.C.Panda (1991). Māyā in Physics. Motilal Banarsidess (Delhi). p. 173. ISBN 81-208-0698-0. ^ Robert S. Mulliken (1975). "William Draper Harkins 1873 - 1951" (PDF). Biographical Memoirs. National Academy of Sciences. 47: 48–81. ^ a b Zeitoun, Charline (September 2009). "Le CNRS a 70 ans". CNRS le journal. Retrieved February 23, 2012. ^ Guthleben, Denis (November 3, 2010). "Un peu d'histoire... La création du CNRS". Comité pour l’histoire du CNRS. Retrieved February 23, 2012. Wikimedia Commons has media related to Jean Perrin.